Home > Spanish Chorizo, the tradition, history, ingredients. 1. What is the chorizo? How the chorizo is made? The chorizo is made with chopped pork meat and pork fat, seasoned with paprika and garlic, all stuffed into natural gut. The red color so characteristic of chorizo is gived by a special paprika known as "pimenton". 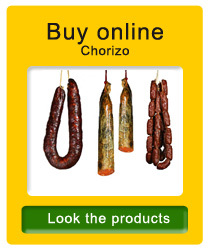 This feature is what makes different Spanish chorizo from other sausages elsewhere. The sausage is stuffed into pork guts, whether the small intestine and the large (for instance), in our time are used edible skin of non-animal origin. The perfect combination of pork meat with a suitable proportion of bacon and traditional curing process, produces a natural product with high calorific value and high biological value protein and special organoleptic characteristics. The chorizo has a primitive origin as it is closely linked to the "slaughter of the pig," one of the gastronomic traditions, festive, cultural and even religious tradition in most rural villages in Spain. Most of families were supplied with a storage of meat for the entire year. Salt: Until the salt does not appear and began to be use we can not talk about chorizo. Salt appears in the years 3000 BC in the reign of Simer, where spicy foods (like meat and fish) and foods were used in trade. In prehistoric times, the meat was better preserved by cutting it into thin strips and letting them dry in the sun. The Fire: After the discovery of fire, possibilities increased for conservation and the smoke as a way to preserve the meat. It seems that the story begins with the "morcilla", blood sausage. In the Odyssey, the ninth century. BC, Homer makes mention of the gut filled with blood and fat that can be roasted in fire. It is the earliest reference we have of a sausage. In Greece and Rome there were different sausages, this can be seen in literary works from this time. In some literary works of classical Greece is named the ham, bacon and sausages. For example, in a comedy of Aristophanes, where the main character appeared with a jar full of sausages. In Roman times some sausages are called "botulus" or "botellos" (by the way), which are now those called botillos, typical from Galicia, Asturias and Leon. The Romans had little liking for sausages. We know that they had many variants of sausages and the "botulus" was a kind of sausage that was sold on the streets. In the fifteenth century cattle are bred outside the cities and parts were sold to butchers when killed. But it was different with the pigs. The pig was growing up in the villages, were killed in the streets and the chorizo was prepared by the family. This custom is something that still exists in some villages, "The slaughter of the pig." It was not until the nineteenth century when the development of meat products is reached , which is closely linked to the progress of industrialization, which gave n greater freedom to trade and movement of goods. Probably the chorizo is the first of the Spanish sausages to be defined by the Royal Academy of Language in the Dictionary of Authorities, 1726 as "short piece of gut, filled with meat, regularly pork, chopped and seasoned, usually cured by the smoke. " In that time the paprika spice was not very common into the Spanish charcuterie. 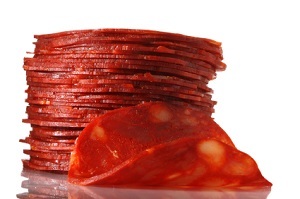 As explained above, the Spanish chorizo is red due to paprika, "pimenton". This ingredient did not arrive to Spain until the sixteenth century from America. Before the discovery of America in Europe sausages were white or black, if they were produced with blood. 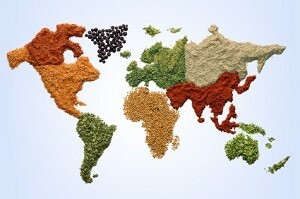 The pepper also came from America, it was originally handmade until it was found in all markets. There's a story involving King Charles IV and chorizo. The king was hunting, he found a chorizo maker who offered the king a chorizo. The king loved it, so he was proclaimed the royal chorizo provider. This fact was portrayed in a tapestry called "The choricero Jose Rico, Candelario" made by Bayeu, brother of Goya. The main ingredients are pork meat and pork bacon, paprika, garlic and salt. But there are as many recipes as different chorizos. The species used can be very divers. Some have a little more of this or a little less of that, it's difficult to know.. The possible recipes can be very varied. The development of the chorizo has always been pretty homemade and each family had its own recipe. - Chop meat and bacon. - Mixing it with all the species. - Rest for 24 hours. - Curing process: tied and exposed to air in the natural environment, choosing suitable sites based on their characteristics of temperature and humidity. The traditional way has always in rooms with fireand smoke in order to protect it from insects. - The period of maturation is a process of drying and acquisition of texture, while the natural flavors develop. The chorizos are cured for around 50 days in a cool dry place. Sometimes the sausages are usually smoked over oak wood and then we let them dry on a cool place. 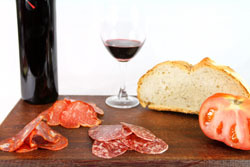 There are many types of chorizos in Spain depending on the meat and the spices used in its production. Also depends on the curing area, onthe way they are tied or their size or their weight, etc..
- Chorizo Iberico Bellota : made with Iberian Pork Ham, or the pigs get Bellota Iberian ham . - Chorizo Iberico : made with meat from Iberian pigs. There are different types such as chorizo candle. 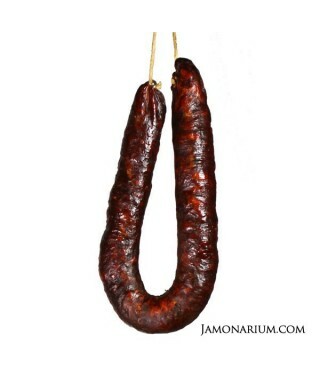 - Chorizo traditional home : made with pork and white horseshoe shaped normally or tied. 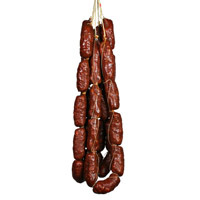 - Wild Boar Sausage: characteristic odor and dark red. This is a high quality product, made from selected meat of wild boar, lean pork, Iberian bacon, salt, garlic, parsley and spices. - Sausage of horse Horse meat has high nutritional value and low fat. It is the highest in iron content and the most sweet and tender than others. Effective in combating iron deficiency anemia. - Sausage Beef: Made with beef, usually mixed with meat and / or bacon. - Deer Sausage: The sausage made from meat from the deer, has a refined taste. Deer meat is tender, natural and clean, smooth taste and distinctive, with a fine texture. With little fat, low calorie, low-cholesterol, has the advantage of being extremely healthy without thereby reducing its flavor. With a good dose of iron and protein, has been called the red meat of the new millennium. Sausage made with pork, smoked and cured cold and icy, dark-red color characteristic spicy flavor and aroma usually peculiar system of healing. The style is more characteristic horseshoe or "run" with the ends tied and bound together by a thread so that they can hang on the poles where it makes the smoking process and draining into the air. It, along with the jerky, one of the more traditional sausages Leon and cuisine, while the best known and demanded by the people who visit the province. 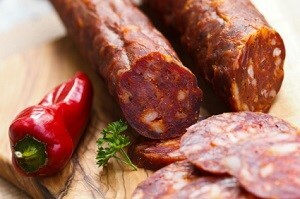 Galician chorizo is made using lean pork, bacon, paprika and pepper, garlic and salt. Its curing process goes through a smoked and dried and later stored in fat or oil. It comes in strings-style sausage and can be eaten raw, cooked, fried and roasted. It is essential accompaniment to many dishes such as pork shoulder with turnip greens. There are different varieties such as the "ceboleiro" to which we add onion and other seasonings. In the region of Celanova (Ourense) is a sausage made of pumpkin in place of the onion. They are excellent for inclusion in stews and even in fabadas are easier to digest. In Extremadura, there is much lar Iberian chorizo, Iberian pigs because of Extremadura, but also find homemade chorizo sausage and some typical sausage-like Extremadura, as patatera Extremadura. The patatera is a sausage typical of northern Extremadura, in particular a sausage-although its appearance and flavor reminiscent of a sausage, which is in the form of a horseshoe and whose production is used the baked potato (50%), along with lean (10%) and fat (40%) of Iberian pig. The reddish color is due to the paprika from La Vera is added and can be sweet or spicy. When you can eat fresh bread smeared as if it were sobrasada or is oread to thick slices. Possibly the Chorizo de Pamplona was the first industrialized meat product, since the first Spanish meat industry was the Navarre. It looks as sailing, embedded in fat gut, with a diameter of about 4 cm and a color, cut, red and orange, because of paprika. It is seasoned with salt, pepper and garlic. It consists of pork, beef and bacon to a lesser extent. It is eaten raw. The texture is creamy and soft but intense flavor, rich and without heartburn. 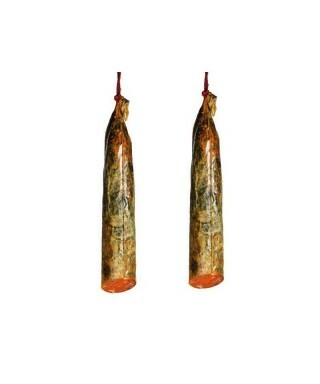 Probably the most famous sausage is the Pamplonica Navarra, Pamplona chorizo authentic. It is made with selected pork to give the product its characteristic chopped razor sharp cutting. Slow aging in natural drying gives it its distinctive flavor and aroma. 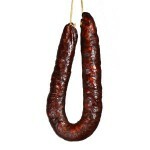 Chorizo Riojano, string-shaped or horseshoe, with a diameter of 30-40 mm, is one of the most typical food of La Rioja, land with great tradition in the production of sausages. This sausage is firm and compact, has a balanced and intense flavor dominates the paprika and garlic notes, a palatable texture, and flavor intense, persistent and sometimes spicy. 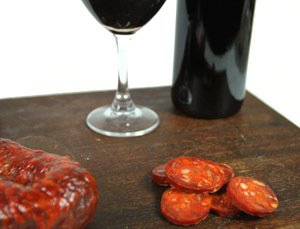 The chorizo Riojano now has a Protected Geographical Indication. In Segovia, chorizo sausage is the best known of Cantimpalos. This product is sausage, cured meat made from fresh pork fat to which is added salt and pepper as basic ingredients and you can also add garlic and oregano, subjected to a drying-ripening. In Cantabria, one of the most popular sausage is to Potes. 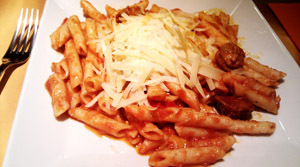 The ingredients used in their manufacture are lean pork, bacon, salt, pepper, paprika, garlic, oregano and thyme. Stresses in the healing process in the natural environment and oak wood-smoked for 25 days, giving it a distinctive and rich flavor. It comes in a horseshoe shape (string), tied with a continuous string of one unit to another. Its use can be raw, fried or boiled. The chorizo and black pudding sausages are more popular in the Canaries. The chorizo sausage canary is a typical paperback Islands. Among the best known are the chorizo sausage Teror palm and sausage Chacon. The sausage is characterized by Teror paperback, easy to spread. Although the most famous sausage Teror is colored red (paprika), there are also white Teror sausage (no pepper). The sausage "chorizo vela" is sailing straight as cular but narrower gauge (about 30-40 mm) and length 40 cm approximately. They say that his name might come because the long narrow shape, resembles that of a candle or candle. 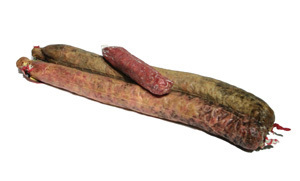 Chorizo sausage in pork casing of a size over 38 mm, irregular cylindrical shape, determined by the morphology of the gut. Natural casing. Variety of sausage made exclusively Iberian ham from Iberian pigs. - Chorizos dulces : El pimentón que se le añade es dulce. - Chorizos picantes : El picante es debido al pimentón picante que se añade. In Europe, apart from Spain and Portugal, there are some places where sausages are also made, especially Hungary, which makes a variety of sausages with paprika base and also Germany, where they have the Paprikawurst "paprika sausage." The Gyula sausage named after its namesake city. It is a mildly spicy sausage, prepared with pork and beef and bacon (fat). This mixture is injected into the small intestine of pigs previously cleaned and begins to smoke. The origins of this product date back to the early nineteenth century. The sausage of Gyula (Gyulai kolbász) remains popular to this day, this is largely due to its delicate flavor that dominate the aromas of red pepper in Hungary, pepper, garlic and caraway that complete with the effect of traditional smoke. The German sausage is a precise combination of beef, pork, bacon and spices, stuffed into natural casing for a traditional German product taste great. The ingredients of German sausage are: Beef, pork, bacon, salt, spices: paprika, garlic, black pepper. Latin America has its own sausages, descendants of Spanish chorizo. Even here there is the European custom of regulation of all, every country has managed to give a distinctive touch to your chorizo, with special marinades and, mostly, more like sausage of Germanic origin, because they are not dried or smoked at all cases. In the north, Mexico has a long tradition choricera, and many of its preparations, especially tortillas, chorizo Toluqueño include, Toluca, the paradise of the Mexican sausage. In popular parlance, the word is interchangeable with Chorizo sausage, although the latter refers to a sausage a little longer. Colombians often accompany their arepas with chorizo, mainly in Antioquia, and is also enjoyed in the departments of Cundinamarca, Tolima, Boyaca, Caldas and Santander, but as sausage. In Venezuela there is a smoked sausage that is mainly used to flavor stews and soups, but there is also the variable soft. Chileans and Mexicans have their sausage and sausage. Peru has a local variety rather orange color, known as "sausage Huacho" very tasty and eaten fried and crumbled bread. 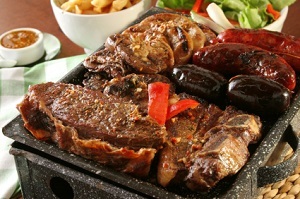 But undoubtedly the most famous sausages in this part of the world are the "sausage grillers," South American specialty. 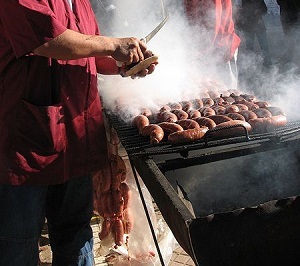 Argentina, Uruguay and Paraguay are the birthplace of barbecue sausage. They look like the Iberians, with the exception of not always be cured or smoked. Also known as Creole sausage and though descended from Spanish chorizo, have been influenced by intense Germanic immigration to Argentina, especially after the First World War, coinciding with the rise of "choripán". Choripán: This is a grilled sausage pieces of bread Between Two. Bread is Generally Prepared in French and Creole sausage grilled. It is the traditional dish DURING the football games and family barbecues. If we speak of a Creole pork sausage mashed, We Talk About a sausage on the part of Participating pork bacon bucking a knife by four mashed pork meat ground, spiced and seasoned with red pepper, nutmeg, oregano, garlic, fennel seeds and wine. Prepared Malthus, broil or grill pan Usually, But You Can Also expect to eat it dry as salami. Also may be mixed meat at a rate of one part of pork bacon pork and beef two two. The chorizo is a major player in Spanish cuisine, either in sandwiches, on the lids, casseroles and stews in, stir fry, and in countless other delicious dishes. The most classic and simple to eat sausage is in the form of tapas. - Cut into rounds with a little bread. - lion Chorizo fried with olive oil. - Skewer sausage Iberian acorn with a stuffed olive and bread. - Given rustic sausage stick. Preparation: The chorizo we can, or not (to taste), cut into slices. What we have in a clay pot with a little oil and let it slowly browning. If we choose the whole sausage must be made to poke inside. When browned add the cider and leave at least ten minutes. So we guarantee that the peculiar flavor of this drink fills the sausage. Ingredients: Chick peas, bacon, ham, homemade sausage , ham bone, onion, garlic, bay leaf, bread, egg, olive oil, wine vinegar, salt pepper and paprika. Preparation: Cook the chickpeas in water with garlic, bay leaf, ham bone and salt. Chop the onion, bacon. Fry the garlic in a skillet with a little olive oil until browned. Remove and reserve. In the same oil, fry the bacon until browned, add the onion and saute. Add the grabanzos the sauce with a little cooking water. Crush garlic with salt and pepper. Dilute the vinegar and add it to the grabanzos. When grabanzos are almost at the point, add the chorizo cut into thick slices. Cook 5 minutes and serve accompanied with fried bread and egg sheets. Ingredients: eggs, potatoes, ham, sausage, tomato, onion, peas, extra virgin olive oil , salt and pepper. Preparation: Cook the potatoes, peel and dice. Peel and chop the tomatoes into cubes. Blanch the peas. Chop the onion and sauté until translucent. Add the diced tomato and cook until the sauce thickens. Incorporate the potatoes and mix. Add the sliced chorizo and ham chips. Simmer 10 minutes. Add salt and pepper. Place everything in a baking dish and top breaking eggs. Add peas bake until eggs are firm. Ingredients: Potatoes, onions, green peppers, roasted red peppers, sausage, chili pepper, paprika, bay leaves, extra virgin olive oil , water and salt. Preparation: Peel and chop the potatoes, chop onions and green peppers, peel and cut into strips and chop the roasted peppers sliced sausage. We put a clay pot on the fire with olive oil, fry the onion, green pepper, sausage and bay leaves, add the chilli, then add the paprika and cover with water. As it starts to boil add the potatoes, leave 15 minutes, add the roasted pepper and eat it warm. Preparation: Leave the beans to soak in cold water overnight. We soaked in warm water, cured bacon and ham bone. We add the beans in a pan with the soaking water and cover with the water until a couple of fingers over them and heat it over high heat until it starts to boil. Bring to the boil introduce the bacon, sausage, ham bone and blood sausage (pre pinned to prevent bursting). We removed the foam which usually contains impurities and also a bit desgrasamos broth. When you take 1/2 hour cooking over high heat we add the saffron diluted in a little hot broth from the pan. We lowered the cooking temperature and add salt to taste. We let the beans cook slowly on low for 2 hours, stirring occasionally with a wooden spoon without breaking them. During these two hours, add cold water twice to "frighten" the beans (boil breaks and helps your perfect cooking). We taste the fabes to see if they are already tender and we rectify the salt, remove from the heat and let rest about an hour. We remove the chorizos, blood sausage, bacon and ham bones. We prepare the meat, cut the sausages into slices generously. Chop the bacon and we took the meat from the bone. Booked for the presentation. Ingredients: Eggs, potatoes, chorizo, extra virgin olive oil and salt. Preparation: Cut the potatoes into slices and fry them until they are soft, not too refried. They move away. Sausage is cut into pieces and refried in a little oil. Add the potatoes and stir a little bit, "crash" the two eggs (not beaten, whole) on the chorizo and potatoes. We add salt to taste. Mix everything with a wooden fork. 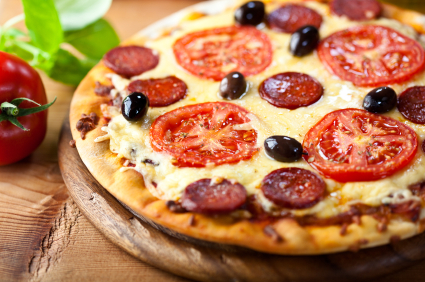 Ingredients: Pizza base, fried tomato, tomato slices, spicy chorizo, paprika, grated mozzarella, oregano, black olives. Preparation: Extend the pizza dough, start putting the tomato on top and spread it with a spoon or a saucepan, then put the cheese and on top the slices of chorizo and tomato surrounded by black olives. To finish it, sprinkle with a little paprika and oregano. We preheat the oven to 180 degrees and once ready we put the chorizo pizza for 10 to 15 minutes, or until it is ready. We take out of the oven and cut into portions. Ingredients: Bread, Iberian acorn-fed chorizo, extra virgin olive oil, salt and ripe tomato. Preparation: Open the bread in half, split the tomato in half and rub it in the crumb of bread. Add oil and salt to taste and place the slices of Iberian chorizo on top. Ingredients: 1 kg of village bread (2-3 days before), 2 chorizos (sweet or spicy), 1 head of garlic, 1 glass of extra virgin olive oil, warm water and salt. Preparation: Cut the bread into very thin slices. In a large pot put warm water and you throw 1 handful and a half of salt. Place bread slices in a large bowl and moisten with the salt water (do not soak, just moisten). When you finish with the last moistened layer cover the container with a damp cloth and let it rest for at least 2 hours. In the bowl where you are going to make the crumbs the oil is poured and when it is hot the garlic cloves are thrown loose with skin (the garlics are given a blow before they are poured into the oil). While the garlic is browned, cut the chorizos into very small pieces. Take the garlic and throw the chopped chorizo. When the chorizo ​​is fried, the sausage is separated from the oil. The oil is passed through a colander and we put them back in the pan. Next the bread is thrown and the secret is to not stop moving with a wooden spoon. When the crumbs are almost loose, the garlic and chorizo ​​turn over and continue moving. At the end and with the fire off you keep moving about 10 minutes. In another bowl, melt the butter and put the flour and proceed to make a thick béchamel, gradually incorporating the milk, while doing it add salt and black pepper to taste the béchamel. When the macaroni are well drained (not rinse) and put them in the pan where we have the chorizo ​​and onion, add the tomato and heat everything together for about 2 minutes stirring occasionally to mix well. We place it on a baking tray that is not too deep. When they are well distributed add on top the béchamel uniformly and cover all the macaroni, add as a bag and a half of the cheese on top, and add a pinch of oregano spread over it. Grill at 175 degrees in the bottom of the oven, when the golden cheese can be removed. Some wines that we think are interesting to accompany the tapa de chorizo could be Somontano aging wines, such as the Sers Temple, or a Rioja, such as the Viña Albina Reserva. 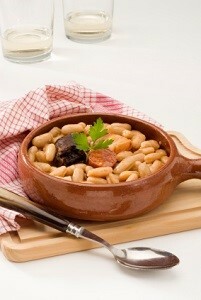 In the dishes where chorizo is part of stews, being potent dishes, strong wines are recommended. The exception would be fabada, they say that the best thing is a very fresh cider, or a fruity rosé. 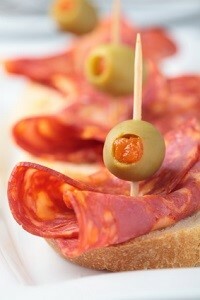 Chorizo de Pamplona is delicious eaten with red wine without aging, taken with a bit of bread. A good wine to accompany it would be a young First Sers. And finally, it's better than a cold beer to accompany a sandwich sausage? In his first spaceflight in 1998, astronaut Pedro Duque was in his luggage a sausage from Leon. A sausage never gone so far. We do not know if I ate on that trip in covers or with chickpeas, but not all foods can be said to have traveled into space. 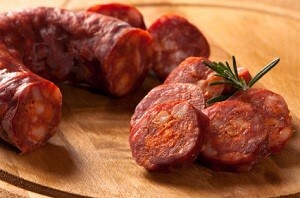 There are many names for Spanish chorizo, most notably that of Cantimpalo (Segovia), white surface, which sometimes leads to ham, the Pamplona (Pamplonica) with finely chopped meat and large intestine, that of Potes (Cantabria), adding pepper and thyme, smoked oak, or Candelario (Salamanca), Iberian pork, such as Guijuelo and Andalusia and Estremadura. The legendary "Sandwich" sausage was the king of the breaks of the schools in the seventies and eighties in Spain, with mortadella with olives and bread with chocolate. He was also one of the most popular lunch masons and laborers, or any worker who had his lunch time. Over time, it seems that the sausage sandwich has lost favor and what is worse, has given way to industrial bakery for breakfast and snacks for children. No doubt a good sausage sandwich is much more than any bakery industry salidable containing cholesterol-producing saturated fat. A good sausage sandwich with good bread and a little olive oil is the healthiest things you can eat for breakfast. 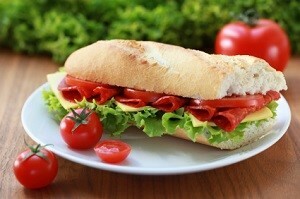 We encourage you to recover the tradition of the "sandwich" of sausage or ham, for your health and pleasure for the body! The origin of sausage popularly called a thief has nothing to do with the rich and tasty sausage we all know. The reason I used that term to describe, in a derogatory way, friends of the alien comes directly from the Romany, the language used by the Roma people and where we can find a whole series of words to refer to everything related to the thieves and the act of stealing: Chori, choraró, choribar, chorar. Over time, the popularization of these words and their use of colloquial language in the population paya, eventually transforming them into sausage or choricear as we know them today. Make the world's longest sausage was the challenge of many towns along the years, to get the Guinness record. In January 2010, Puertollano (Ciudad Real) proposed such a challenge and managed to beat the record, which was achieved in 800 and 1018.4 m in length and 750 kilos of meat. 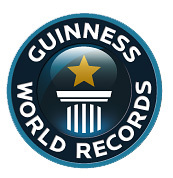 In April 2010, Toluca (Mexico), surpassed the record of Puertollano and managed to make a sausage of 1245.42 m.
But in March 2011, Santa Rosa de Cabal (Colombia) established the current Guinness record with a 1850m-long sausage. The house is a type of sausage typical home in Buenos Aires and Rosario in Argentina, which eventually spread to other cities. Is basically a side yard that give the rooms, which are in line and connected. Due to this arrangement, called chorizo house such as the environments are linked one after another, like sausages on a string. The origin of the sausage house dates back to the Roman house, consisting of a roughly square courtyard in the center was a cistern, where they gave all the interior rooms to the courtyard. A gallery or porch roof provided shade and shelter from the rain at the entrance to the rooms. For the history of cinema, the western Italian will always be remembered with the trite nickname Spaghetti Western, but Western exclusively or mostly Hispanic, but many people ignore it, it had its own name: Chorizo Western. Generally, though we claim the end of Western Chorizo, which also fits well with the specificities of the western Spanish: vulgar, extremely fast craft and production. The Western film has not been produced in the U.S. is known internationally as a Spaghetti Western, this designation would not be correct, since this should correspond only with the western Italian, on the other hand the European western most abundant in the history of cinema. Writers and poets make mention of the virtues and benefits of sausage in literary texts. Thus we find references to Cantimpalos sausage in a Spanish fine dining guide entitled 'Inventory and praise of classic cuisine of Spain and its regions', paper of 1929 which speaks of Segovia and sausages, "reaching maximum fame with sausage and Bernuy Cantimpalos. " Even Camilo Jose Cela (Nobel Prize 1989) makes a similar reference when he mentions "Cantimpalos, famous for its sausages." The same author says in 'First trip Andalusian' (1959) who took "a bread, a sausage and wine classic and sturdy, exquisite and planned, Orthodox and as God is in everything, command are: bread, bread , wine, wine, and sausage, lean pork with spices and paprika seasoning. " Duels and losses are a traditional dish from the kitchen of La Mancha, whose main ingredients are scrambled eggs, sausage and bacon streaky pork, all prepared in the pan. This is a high calorie dish, known internationally for his references appear in the book of Don Quixote by Miguel de Cervantes. 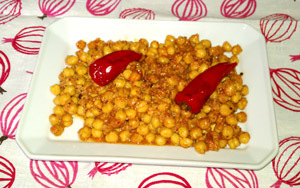 Today it is very popular in restaurants in the region of Castilla-La Mancha, which is usually served in a clay pot. Botillo: The botillo is another unique sausages from Spain, typical of the region of Bierzo, Leon. To do this, the blind pig stuffed with pieces of about 4 cm that come from plants: mainly ribs and tail, but also tongue, cheeks and spine. Before the meat is seasoned with paprika, garlic, salt and oregano. Then smoked, resulting in one piece globosa having between 0.5 and 1.5 kilos. It is eaten cooked with potatoes, chickpeas and cabbage. Blood sausage: How much like you have blood sausage, sausage of the same blind gut, but made with lean meat obtained from the trapezius muscle and the head of the Iberian pork loin, marinated with paprika, salt and spices. 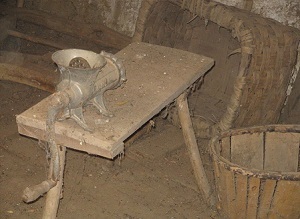 It is consumed after curing for about ten weeks. Here the palm is carried by Extremadura and Jabugo Guijuelo. The black pudding: Among the black pudding, whose common basis is blood and lard, there are numerous varieties. One of the best known is that of Burgos, a product that has little more than two centuries old, because until then the rice was not there an affordable product, which incorporates ingredients that rice swine, by 30 100 of its weight, onion, paprika, black pepper, oregano and salt. The sausage has a diameter of about 6 cm and consumed fried in slices. Botifarra: In Catalonia, the blood of the pig is destined for the black botifarra containing animal fat and meat. Throughout the Spanish Mediterranean coast there are many types of botifarra: white, with egg, with language, with liver, truffle, onion and pine nuts from pan and others. Are stuffed into guts of different diameters, which reached a peak in the bull and bisbe. THE SAUSAGE: The sausage, among which that of Vic ( llonganissa ) is a cured sausage into guts of the large intestine, about 7 cm in diameter. Generally contains pork and other animals such as cattle, deer, wild boar or donkey. In Arles (France), made with a mixture of donkey, cow and bacon chopped into small pieces. The sausages are salt and peppercorns. 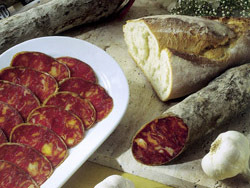 Sobrassada: In Balearic sobrasada also manufactures a semi-cured raw sausage its characteristic reddish color normally spreads.